not much romance tonight but I bawled with Hee Joo when she saw her boyfriend all bleeding and wounded... PSH can cry a river and still look gorgeous.. the crying looked very natural..
other than the OTP.. my tired stressful brain is too weak to express more opinion so I’ll wait for the english sub... anybody want a good streamlink for tomorrow, PM me..
HJ can see JW wounds and she cries. People around them is taking pics of him and he tells her to sit down. NPC came to attack them and he shoots them. He tells her to take the lens off. How can she still not se any NPCs and even his wounds are gone now? Back to SeJu and Marco its JW narration. SJ calls CHS I think he used Marcos phone to do that but CHS doesnt know him. SJ is scared becos Marco is now dead. CHS is threatening SJ so SJ hangs up the phone. CHS calls him back but he cant be contacted. SJ then takes JW details from Marcos body to contact him....as we saw in previous eps Marco hunts SJ leading him trying to escape him. the dress HJ wore in this episode is the same she wore in the BTS of 'episode 16' fan cam? The thing with this drama is that there are a lot of flashbacks (which takes a lot from the drama). I am not a fan of flashbacks especially if it's done excessively. We spent a lot of earlier episodes on this technique which I felt personally that there was no need to provide such. A lot of flashbacks could have been shown once. The audience can remember it easily either way. If a flash back is shown, there has to be significance. If it keeps getting shown without any meaning, it becomes boring as you stated and to me, it becomes redundant. Flashbacks should add more to the story. In this case, seeing the same scene in a flashback in almost every episodes makes me feel that the next 4 episodes will just be rushed. Did Marco stab Se Joo with a real knife ?? A REAL KNIFE ?? OMG!! What do you think will happen today? 2. Will HJ play? I don't mind either way. But i hope she's active this ep. 3. What will emma do? Other than sitting on that chair and playing guitar looking wistfully in the horizon. I hope she does something significant. 4. Will JW find the next clue? Hopefully. But before that he needs to level up tp level 100. I need to know what that key is for. Need too know since last week. 5. Will Papa Cha survive the game? I dont mind if he doesnt. He seems like a disposable character. 6. Whats office dude (new CEO/JW's friend) deal? Is he good, is he bad? 7. Will zombie cha appear? Yes please! Park Hoon looks awesome in that suit, bloody and all. 8. Will zombie Seo appear? I hope not. Cause if he appears it means JW is in danger lol. 9. Will JW's ex wives appear again? No need. As much as i like both actresses, no need. Proceed with the game please. Thats about it i think..
1.SJ appeared with new scenes yay! 3. Emma can interfere with the game. She did something but i'm not sure what it is. Either pausing or making weapons dissappear. 5. Papa cha survived but he's scared. 6. I'm not sure about this. But he did call JW to warn him that he is wanted. 7. Zombie Cha and alive Cha both appeared. Yay! More Park Hoon. 9. Both wives appeared. Not sure why though. Yes Marco did stab SJ and Emma saw it. She caused the game to glitch and they went into the game mode. Emma seems to have a peace keeping function. But why, if se turned the game on wouldnt she deactivate both Marcos and SJ weapons. I need subs lol! We get a hug that HJ initiates... and I dont blame her lol! oh boy so we got a lot of flashbacks. I seriously don’t like using flashback as a flow of pace. Wow.. I'm so satisfied with the episode. As I wished no romance, but full of games. Writing flashback is not an easy thing to do. Very tricky and not advisable for rookie writers. Only great writers can write flashback well, and I think SJJ is one writer who can do flashback well as proven in her previous works. Incorporating flashback into the story also shows that she has planned and thought out the flow from beginning to ending well. 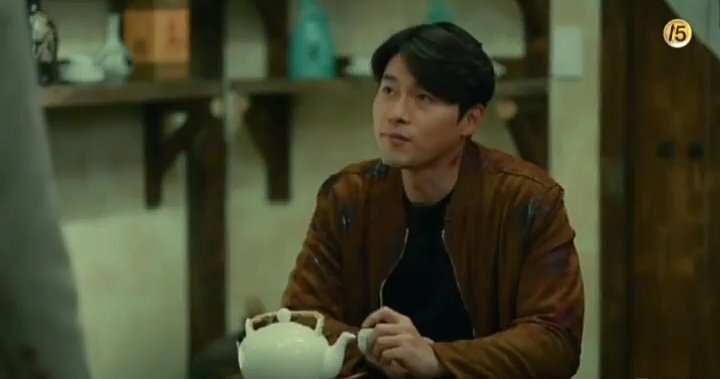 I agree that excessive flashback may be confusing, but so far I think it is still alright compared to many other dramas who used flashback only as fillers. Here, there is usually a new explanation, so it serves like a memory booster for me actually. MoA must have been written in flashback to keep the guessing going. Updates on our polls ... a deal is a deal. To those whom answered NO for poll 1 (myself included) We've become zombies....ARGH!!!!! and Congratulations to the grinners. Smart girl using her game ID - Emma to find JW. Poll question 1 : Will He Joo be apart of the game? Yes or No? Choose one answer and sorry no changes allowed. Make your wise choice. Polls starts now and will end before each episode is aired live. It will reopen after each episode and only if the answer isnt revealed. Consequences: Winners will be grinners and are allowed to change your profile of your choice. Losers turns their profile pics into zombies for 1 week. Yes Im willing to give up my Anh Yoo Na and turn her into a zombie too. Im not sure if we got our answer for poll 2 so I'll place that on hold till tomorrow when we can watch the sub ep for some clarification. I thought I saw BTS with JW wearing white jacket with a black cast on his leg. But I dont recall seeing this scene. Did I miss the scene? Those who are watching on Netflix like me..subs are up.. I just realised that there this is whole Game of thrones kind of theme intro song for MOA..lol..
YR: Please listen carefully to what I’m about to say, since it will be a big help in your investigation. Reporter: Why are you suddenly participating today? HJ: What is going on? Programmer: Things have suddenly become worse. JW: Why aren’t you listening to me? Really. I told you not to log in. JW: There is something that I need you to go home and help me with again. Park: Is there any news? Programmer: Yes, he reached level 100. JW: Don’t think about shutting down the server unless you want us all to die. JW: Though there has never been a time when I believed in God, I would like to depend on him now. JW: May this, please, be the end.